The very first Sunday Challenge in 2010. This one sounded too easy at first, but I had a surprisingly hard time deciding what to do. It was raining and dreary and my husband just randomly googled "best food for a rainy day" and discovered that apparently the concensus is "grilled cheese and tomato soup." So he challenged me to provide my take on this classic rainy day food. The challenge : Grilled cheese sandwich and tomato soup. My thought: I understand that I just have to come up my version of them but I really wanted to do something unique rather than just making a gourmet version. But I ended up with something not so unique. But I executed pretty well, so we still had a yummy meal. Judge's verdict: The objective here was a truly original and creative take on a classic comfort food. Because the item and ingredients are very basic I was looking for some serious out of the box thinking. In that regard, the deconstructed cheese sandwich/soup was on the right track. To take the major ingredients and put them together in another order was a terrific idea. 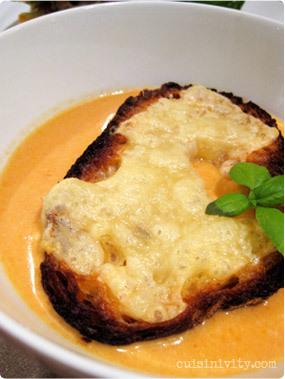 In this case, the cheese was mixed into the tomato soup and the bread was converted into a toast on the top of the soup. The soup itelf was good. Almost felt like eating fondue! Very rich. The toast on the top was a little clumsy, however. Too big to eat with the spoon, but too wet on the bottom to pick up with your hands. And frankly, too thick. I really like the attempt but think a little more thought and experimentation would really refine an interesting way of putting these ingredients together into one dish in a way that works a bit better... something midway between soup/sandwich and fondue. A really excellent attempt. The other sandwich was simply cheating. I think she was nervous that her creation wouldn't work and she wanted to make sure we had something good to eat. And while it wasn't as creative, it was wonderfully good to eat! Perhaps one of the best sandwiches I have had. 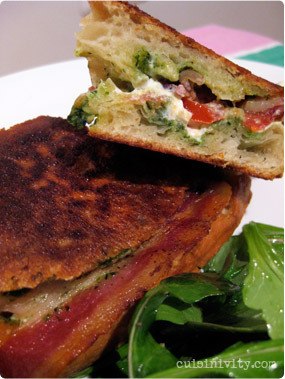 The choice of cheese and pesto was the focus, and the brioche and bacon added some salt and texture to the piece. This is a recipe worth remembering - no refinement necessary.